Japanese Episode DP 014: "Leave it to Takeshi!" American Episode 478: "Leave It To Brocko!" One day, a Konohana falls from the tree it's sleeping in and gets separated from its friends and family! The grass-type pokemon wanders its way to a Pokemon Center just as Satoshi and his friends arrive to rest. 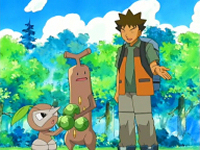 After Takeshi gains the pokemon's trust, our heroes decide to help the grass-type get home. However, their adventure is disrupted by an appearance of the Rocket-Dan! The trio kidnaps Konohana, Takeshi, and Takeshi's Usohachi and takes them back to their hideout. There, Takeshi tricks Musashi-tachi into letting him and the pokemon go by offering to cook for them. As Takeshi continues his escape, his Usohachi evolves into Usokki! At that time, the Pokemon Breeder spots the tree where Konohana lives, so he decides to deliver the pokemon to its friends before reuniting with Satoshi-tachi. However, the Rocket-Dan resume their chase and start a battle with Takeshi! Takeshi's Gureggru is able to defeat Musashi's Habunake, but it collapses after its final attack. Next up is Takeshi's Usokki vs. Kojirou's Muscippa. By using a combination of Double Edge and Mimic, Takeshi is able to defeat Kojirou's pokemon. Satoshi and Hikari find their way back to Takeshi, so Musashi and Kojirou bring out their Dokucale and Sabonea. At that time, a wild Dartengu appears to protect Konohana! After Dartengu defeats the Rocket-Dan's pokemon, Satoshi's Pikachu steps in and sends the trio blasting off again with a Thunderbolt attack! Now that Konohana is reunited with its family, Satoshi and his friends finish the last leg of their journey to Kurogane City. Oh look, it's another boring fil...wha!? It's an episode centered around Takeshi!?!? And he actually does things!? Double-you tee eff? Yes, an episode starring Takeshi is about as rare as you can get, so when one does show up, I think we should all take notice. Everything that a fan could like about Takeshi is on display in this episode; his cooking, the way he knows how to take care of pokemon, his battling skills (yes, he has them!). I especially liked the part where Satoshi tries to steal the thunder from Takeshi and he's all like "uh...no thanks." It's about time Takeshi gets some spotlight. The dubbed version keeps an astounding seven pieces of music, which is the most PUSA's kept in a while. Could the company be gradually weaning fans off the dub-only stuff? I very seriously doubt it, but the 0.00001% of me that's still holding out for a dub that leaves the Japanese soundtrack alone is hopeful. So in Japan, this episode aired as the second half of a one hour year end special. Because of that, there's nothing played before the episode's title screen...no animation, no opening theme, nothing. The show comes back from its commercial break and immediately jumps right to the episode's title screen. Well, the dub starts off with a repeat of the scenes of the Rocket-Dan looking at the ingredients they have before Takeshi offers to make a meal out of them. Then we get the opening animation, and then we get the episode's title screen. So the question is...did PUSA add this repeated footage at the beginning? I'm not really convinced that that's the case. The reason I put a question mark in the heading for this edit is that while the TV airing of the Japanese version of this episode didn't have a cold opening, the DVD version might. As of this writing, the rental DVD's are only up to DP 008, and the episode has yet to be rerun on Kids Station or anywhere else, so there's really no way to verify any of this. Meowth: "That Shiftry's the one who was nasty to you, Nuzleaf! We were only trying to be nice and help ya out!" Originally, Nyasu was telling Dartengu that the twerps were trying to take Konohana and that they (the Rocket-Dan) were only trying to help it. Dartengu, in response to this, starts to turn on our heroes. The dubbed version doesn't make any sense at all because he's basically telling Nuzleaf that Shiftry's a bad guy. Not really the best thing to do if you're trying to get Shiftry to help you out, now is it? The TO BE CONTINUED screen is three seconds longer in the dub.